“Should workers struggle?” was the theme of a meeting of trade union and Communist Party activists held in Sydney towards the end of 2011. The following article is the contribution to the meeting by MALCOLM TULLOCH, NSW state secretary of the Construction and General Division of the CFMEU. The history of the working classes has always been one of struggle. There is no condition or entitlement that we have today that hasn’t been hard fought for. Superannuation, long service leave, an eight-hour day, rostered days off, paid holiday leave, workers’ compensation, paid sick leave, accident insurance and pay rises were not given to workers by generous bosses. Instead, workers united around these causes, put their pay packets and jobs on the line and fought with strikes and demonstrations to secure justice in the workplace. It is a historic fact that each of these incremental victories by the working class was fought against with the fury of a world war by employers, big business and conservative political forces. They were Hanrahans who declared “we’ll all be ruined before the year is out”. And that was and remains the big lie that business pushes. Despite dire predictions, almost 60 years after the 40-hour working week became law, it’s never been a better time to be big business and workers are fighting a rearguard battle to defend even the right to a decent day’s pay. BHP Billiton made $23.6 BILLION dollars profit – a corporate record in Australian history. Australian banks are among the most profitable in the world. The Commonwealth Bank alone made a $6.83 billion full-year profit with Westpac just pipping it in the history-making stakes with a $7 billion profit. The ANZ and NAB weren’t far behind and the sector will have a combined profit this year of $26 billion. In construction, profits in 2010 increased 55.5 percent and Australia’s biggest builder Leightons made $300 million profit in the first three months of this financial year alone. Qantas bosses tell us the company is struggling yet it is one of the most profitable in the world and despite floods and earthquakes still pulled in half a billion dollar profit in the financial year just ended. It’s not only corporate Australia that is doing very well – the people that run corporate Australia are having the time of their life. In Australia the average CEO’s total pay packet is now worth almost 100 times that of the average worker. So Alan Joyce at Qantas can give himself a 70 percent pay rise, and at the same time refuse to negotiate a fair pay rise for the people that actually help keep the planes in the sky. So we have record profits and obscene executive pays and big business still wants more. When Joyce shut down all Qantas flights, it wasn’t about a pay dispute – it was about crushing the union movement and you could hear big business cheering from the sidelines. It is no surprise that the Qantas board is overloaded with anti-union heavyweights from mining multinationals, chief among them chairman Leigh Clifford who headed Rio Tinto during its push to put workers on contracts. The truth is business in Australia is intent on driving wages down. Westpac’s profit was in large part fuelled by getting rid of staff. They are not the only ones shedding workers to boost profits. Qantas has announced 1,000 job cuts and wants to send jobs off-shore to Asia. We all know the fate of Bluescope steel workers in the Illawarra and there is BHP’s record-breaking results. There is in Australia a conga-line of corporations that have no moral compass when it comes to workers’ safety, job security and rights. This lack of morality in business is best exemplified by Albino Albores, a carpenter who worked for Bovis Lend Lease for 35 years. The CFMEU is now fighting an unfair dismissal claim for Albores after he was sacked recently because of the downturn in construction. It’s not so much the loss of his job that has hit Albores, but the manner in which it was done. This 60-plus-year-old was convinced to come back to work from a rare use of his sick leave because Lend Lease needed him to work. So he turns up at 7am and is told he needs to clean out a container. He walks around to the container and standing there is a Lend Lease manager with Albores’ termination papers. So after 35 years of loyalty, the company can’t show this ordinary man enough respect to take him into an office and offer him a chair while they sack him. That is how big business operates in Australia today. The bottom line is everything and humanity and dignity cost too much. 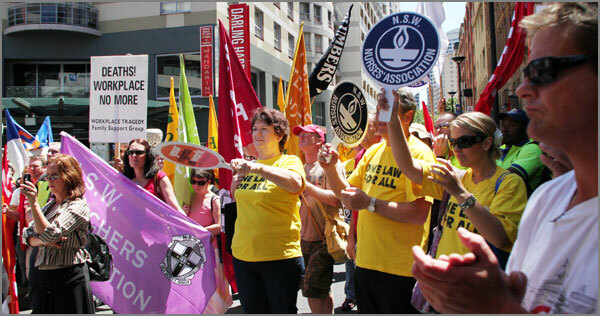 In Australia, unions are fighting a concerted bid by business to drive wages down. They are doing this by offering individual contracts, using illegal immigrants and by turning workers into small businesses through the use of Australian Business Numbers and sham contracting. Not only does this reduce the cost to business it means ordinary workers are carrying the risks of injury and sickness and safety. Across the world there is a desire and a momentum for change coming from the working classes. Nations are still reeling from the global financial crisis created by corporate excess and corruption. The bonus system is still operating on Wall St and trillions of dollars has been spent propping up the capitalist structure. So those that created this crisis have walked away unscathed. Yet the innocent in all this – workers – are still paying. Beside the drop in superannuation income, in Greece huge cuts to pay are being demanded to meet debts. In the US, Republican States are using their debt issues as leverage to cut health insurance to public sector workers and ban collective bargaining. In Australia, the Qantas dispute has in many ways galvanised and come to symbolise the working class’s fears for the future of their work and a sense of fatalism about job security. The union movement needs to take up this challenge here and overseas. We need to seek out our brothers and sisters in developing nations and stand by them as they create labour movements. First world businesses should not reap record profits on the back of other people’s poverty. Rather than a race to the bottom, we should be demanding first-world conditions, safety and pay for third-world workers. Not only will this help pull those nation’s economies forward, it will negate the need to move jobs offshore. In first world nations like Australia, workers need to remember the gains of collective struggle and raise their voice politically to protect that right. We cannot be apathetic. We must honour the gains of the past by continuing the fight. We are here today asking should workers struggle? The answer is, was, and always will be, YES.